Train three times a week on nonconsecutive days. Use a different exercise chart for each workout day of the week, using the charts in order. Always try to encourage your muscles to use more weight, but do this gradually, adding a few pounds at a time when possible. Learn to judge your workout strength, being on the lookout for days when you are above normal energy, as well as for days when your power is lower than usual. At such workouts use more or less weight in the exercises, according to your physical feeling. For the first month perform one set of 6 repetitions of each exercise, adding weight when you can. During the second month do 2 sets of 6 reps of each exercise, using the same weight for each set, adding weight when you can perform both sets for 6 reps. For the third month do a set of 5 and a set of 9 reps, using less weight on the second set. The first set should be hard and have to be performed slower, the second should be faster and more rhythmic. If you are still making good gains on the first series of routines, then do not change at this time. Rather, wait until you reach a slowing up point in your gains, and then take a week's rest and start in with the following routine. It's wise to always exhaust the gains of each routine before changing over to another one. This is a good point for you to remember. Only you can decide if you are actually ready for the split system of training or not. Use the above as your guide. Don't be too anxious to start on this split routine style, and remember that you can come back to the full body method of training no matter how advanced you become in the future. In this version of the split system of training you are to work out four times a week, on the following days: Monday, Tuesday, Thursday, Friday. The exercises that you are to perform on Monday and Tuesday are divided up on Chart Four. On Wednesday you rest. Thursday and Friday you use Chart Five. On Saturday and Sunday you rest. In all exercises, and from workout to workout, adjust the poundages you use according to your strength on that particular day. Some days you will have more energy and will be able to use more weight. On other days the energy may be lower, and you will have to use less weight. Do not follow any set pattern in increasing poundages. In some movements you may be able to use a few more pounds almost every workout. In others, you may find that a certain poundage is your limit for a week or longer. The important factor is to use as much as you properly can and still complete the correct number of sets and repetitions, each workout. If you follow this plan, you will be bound to make the best results. Follow this program for two months, then take a week's rest. If you have been been making excellent gains on this program then you can go back to it for another month or two. Or, you can specialize on some part of the body, or a specific lift. Or, you can proceed to the Power and Bulk course listed next. However, you should change from one routine to another only when you have exhausted the present possibilities of your current routine and not before. You can always tell this when results start to slow up for a period of time. This means you do two exercises in the following manner: First, you perform a set of Exercise 1, and as soon as you complete this, without a rest -> go to Exercise 2 for a set. Only then do you take a short pause. This is called "Super Set" - combining two exercises, one done immediately after the other without a pause. 1) Wrestler's Bridge - 2 sets of 10 reps.
3) Lying Triceps Curl 2 x 9 each. 5) Seated One Dumbbell Triceps Curl 2 x 9 each. 7) Dumbbell Side and Forward Combination Lateral Raise 2 x 9 each. Start this exercise holding a pair of dumbbells at the thighs, while standing erect. 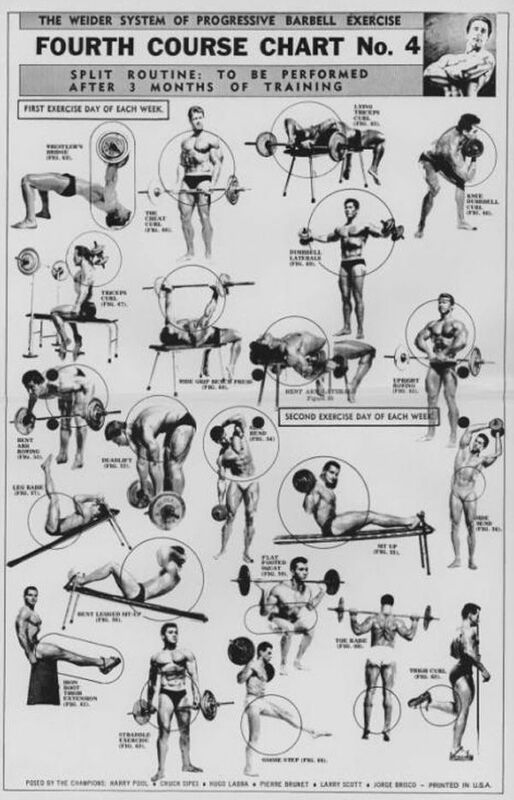 Now, raise the dumbbells simultaneously, directly off to either side, until they are slightly above shoulder height as shown in the illustration on Chart Four. When the dumbbells arrive at that position, maintain them at this height, and move them to the front, until they are extended in front of the body at shoulder height. Now. lower the weights down to the thighs, directly to the front. This is considered as being one repetition. 9) Upright Rowing 2 x 9 each. 10) Bentover Row 2 x 9. 11) Stiff Legged Deadlift 2 x 9. These 11 exercises conclude your Monday workout. If you feel that you have extra energy and would like to do a little more, then perform several exercises with a neck strap, wrist roller or grippers. 2) Weighted Sit Up 2 x 10 each. 4) Weighted Leg Raise 2 x 10 each. 5) Bent Legged Situp 2 x 10. 7) Calf Raise 2 x 10 each. 9) Leg Curl 2 x 10 each. 10) Straddle Exercise 2 x 10. 11) Goose Step 2 x 10. Do not use too much weight in neck exercises. It is better to employ a moderate one and perform about 2 sets of 20 repetitions. Besides the exercise illustrated there are a number of other movements which can be done. The head can be twisted from side to side, the headstrap can be reversed on the head, with the weight situated behind the body, and the head is pulled down to the front. You can also lie on your back on a flat bench and permit your head to extend over the edge of the bench. The headstrap is worn so that the weight hangs from the rope, down toward the ground. You can then raise and lower your head or twist it from side to side. You can also reverse your body position and lie on your stomach, wearing the headstrap while in that position. In addition, you can lie on the bench on your side, and then move your head up and down for direct exercise of the thick muscles on either side of the neck. There are many variations possible. You should perform several each workout, changing them from time to time to make certain your neck is fully exercises from all angles. 3) Barbell Triceps Rear Raise 2 x 9 each. Commence the Zottman Curl holding a dumbbell in each hand, at the thighs. Now, curl one dumbbell in, toward the center of the body, and up to the shoulder, in a circular motion. Once the weight has arrived at the shoulder, twist the wrist to the front, so that the weight is held as shown in illustration No. 68 on Chart 5. Lower the dumbbell off to the side of the body, and down to the thigh. While doing so, perform the same curling and lowering movement alternate, and continuous with both arms. 7) Barbell Press, Back and Forward (Bradford Press) 2 x 9 each. To start this exercise, hold a barbell at the shoulders as shown in illustration 71 on Chart 5. Now press the barbell up, only high enough to clear the head, and then lower it behind the head, onto the shoulders at the rear of the body. Immediately press the weight up again, high enough to clear the head, and lower the weight back to the starting position. Count each time you press the weight from either the shoulders in front of the body, to the rear, or from the rear shoulders to the front of the body as one repetition. In other words, when you press the weight from the front, and lower it to the rear, it is one repetition. When you return the weight to the front, that is the second repetition and so on. 9) Shrug 2 x 9 each. 11) Good Morning Exercise 2 x 9 each. Illustration 76 on Chart 5 shows the start of this exercise. Bend the knees considerably from this position, and quickly raise the bar to the chest. To do this you straighten the upper body and legs and at the same time you pull up hard with the arms, whipping the weight to the chest. Hold the weight there for a moment, and then lower only as far as shown in the illustration and repeat the cleaning of the weight to the shoulders and immediately repeat. 2) Twist Situp 2 x 7 each side. 4) Leg Raise 2 x 9 each. Start this exercise with the body raised approximately half the distance of a regular situp. Now, hold the body in that position and twist it to the side as far as possible as shown in illustration 81 on Chart 5. Always maintain the half situp position during the entire exercise. The exercise action is confined directly to the twisting of the body from side to side. One good method to control the distance of the squat is to place a flat bench or box behind you, and then squat down to the bench. This will make it impossible for you to squat lower than you should with this exercise. As soon as your buttocks touch the bench you immediately rise to an erect position. 7) Legs Split Calf Raise 2 x 15. 8) Front Squat 2 x 9. 9) Combination Toe Raise, Toes Front, Side, Inwards 15 repetitions each. 10) Iron Boot Side Thigh Raise 2 x 15. 11) Palms Up Wrist Curl - 2 x 15. 12) Palms Down Wrist Curl - 2 x 15. Physical power and potential muscle size are directly related. I have seen this proved time and time over. As an example, when Reg Park first visited America in 1949, he possessed a good physique, one which had already won him the title of Mr. Britain. At my suggestion, he made his workouts shorter, and pushed himself to the limit in power. The results were dramatic. As he gained new power in the bench press, cheating curls, squats and the other exercises in his program, an increase in strength led to greater physical size. I offer the above illustration to impress upon you the importance of working for power when training. Because of this power you will be able to work harder in future programs due to your strength. In training for power, as opposed to strict bodybuilding, you have to follow different principles. Your workouts must be shorter, but far more intense. In this course each exercise should be performed for 2 sets only, and you should try to use a weight which will permit you to perform 6 repetitions each set. I say TRY to use such a weight, for if you are training properly it will not always be possible for you to do it. Using the floor press off boxes as an example, here is what you should do. Your first workout, select a weight with which you feel you can perform 6 correct repetitions the first set. Perform this first set, and if your weight selection has been correct, you will just barely succeed with the 6 reps with very little strength to spare. Then, take a rest of three to five minutes and perform your second set. If the weight has really been close to your limit, you may find it impossible to perform the full 6 reps on this second set. However, you will be able to perform 3, 4 or 5, and that will be satisfactory for that workout. Now, the next workout use this same weight and once again perform 6 reps for the first set. Chances are you will find them a little easier than the last workout. Take a rest and again attempt to perform the full 6 reps in the second set. This time, because you did not extend yourself so much the first set, you may be able to force out one or two more reps, possibly performing the full 6 repetitions for your second set. The next workout add weight to the bar, and once again 6 reps will no doubt be your absolute limit on the first set. The second set, you will be lucky to squeeze out 3, 4 of 5 hard reps again. However, in a few workouts you will again find that your strength has increased to the point of being able to do two full sets of 6 repetitions, and once again at your next workout you will increase the weight on the bar. Just as long as the weight is never more than you can use for 6 reps the first set you are training right. The entire pattern to follow during this routine is to concentrate solely on using heavier weight, heavier weight all the time. You are to cheat in the exercises using a swing and some momentum from the body, a bounce, or any exercise style which will allow you to handle heavier weights. Think always of power. Shoulder Bridge – This exercise is performed by holding a barbell at the chest while lying on the ground. The body is then arched and raised up high on the upper back and shoulders, and the weight is pressed to arm’s length above the chest. If you raise your body, bending your legs and placing your feet under the hips to do so, you can partly roll and partly lift the bar with you until it is securely at the chest. From this position, you raise high onto the upper back and shoulders, pressing the weight at the same time. You remain in this position and lower the weight only as far as the chest, remaining in the shoulder bridge position, once again pressing it to arm’s length above the chest. After you complete what you are certain is your final repetition, you allow the weight to ride forward until it rests on the body at the waist, and you then lower the hips to the ground. The weight will lower along with them. Practice this movement with a light weight at first, until you learn the most efficient way of getting the weight off the ground and to the starting position of the press, and then back to the ground again. The secret in raising maximum weights in the shoulder bridge is to press hard with the legs and to raise as high as possible onto the upper back and shoulder. The higher you raise, the greater a poundage you will be able to handle, and in turn you will develop greater power. Cheating Barbell Curl – In this exercise you will soon be using from 150 to 200 pounds. No attempt is made to maintain a strict body stance. Instead, at the start of this exercise you are to bend forward, thrusting the hips to the rear to do so. Then, you whip the hips to the front, and at the same time you start curling the bar to the shoulders. When you reach the halfway point, or the approximate sticking point of the curl, bend the body back to give you greater curling power. In lowering the weight, control it as much as possible on the way down. As it lowers, bend the body forward so that once the weight touches the thighs again you will be all set to whip it back up in the curl. In this way you can set up a strong exercise rhythm. Deadlift Off Boxes – This exercise is one of the greatest bulk and power builders in the world. It is simply performed. You set up the barbell on two boxes at a height above the knees. Then, you raise the weight off the boxes, assuming a standing position. Lower the weight and repeat. Do not rush progress in this exercise. Rather work up gradually, adding a few pounds each workout until you reach your maximum poundage. You will soon be using a lot of weight in this movement, for 500 pounds is not exceptionally heavy to use. Cheating Lateral Raise – Stand erect, holding a pair of dumbbells, one in either hand with the weights held to the back, behind the body. Then, with a slight motion from the legs, and a heave from the body, the dumbbells are moved off to the side and overhead. The elbows are permitted to bend slightly while raising the weight above the head to permit you to use heavier poundage. Lower the weights to the side, controlling them as they are being lowered and then swing them up again. Bench Squat – To perform this exercise you place an exercise bench or strong box to your rear. You then take the barbell off the squat racks, as in the regular barbell squat, stepping back until your hips are directly over the stool. You then squat down and sit on the box. Just sit down as you normally would into a chair, of course carefully maintaining your balance so as not to lose the weight or overly lean forward while doing so. As soon as your buttocks touch the bench you return to an erect position. DO NOT BOUNCE, or jar yourself by sinking down into the squat too fast. Rather, keep yourself in complete control at all times and make the legs, hip and back do all the work. Cheating French Press – Start this exercise holding a barbell above the head while standing, with a fairly close grip. Now, lower the weight behind the head by bending the elbows. However, while doing this keep the elbows up high, with action being restricted as much as possible to the elbows and lower arms. There will be some movement in the upper arms, but make every effort to hold this to a minimum. Once the weight has arrived behind the head, still keeping the elbows pointed high, raise it up again to arm’s length above the head. However, you can cheat by using body motion in this to help you to use a heavier weight. You can cheat in any way you find efficient – OTHER than changing the position of the elbows, which must remain pointed high at all times. Cheating Rowing Motion – The cheating rowing motion is performed identical to the bent over rowing motion, except that you use considerable body motion in the cheating version to permit you to handle heavier weight. Use a comfortable hand spacing, neither too wide or too narrow. Get a secure grip on the bar and then with a combined action of the arms, upper body and lower back, pull up the weight to the chest. Use as much body action as you need to really pull up a heavy weight in this exercise. Floor Press Off Boxes – Here is one of the greatest upper body developers ever devised. It strengthens and builds up the wrists, forearms, upper arms, shoulders, pectorals and upper back. It also gives you greater tendon and ligament strength, so important when training for power. To perform the exercise you raise a barbell onto two boxes, which should be approximately 12” high, You then lie under the bar so that it crosses your upper chest. Take a wide handgrip on the bar and then press it out to arm’s length. The barbell should be raised high enough off the ground so that you will have to press it out only 3 to 4 inches to reach arm’s length. You will be amazed at how rapidly your strength will increase in this exercise. At first, 150 to 200 pounds may be more than enough. In a few weeks you will be able to use 50 pounds more and 400 to 500 pounds is not a heavy weight to press out in this manner. This concludes your power and bulk routine. Train three times a week and give everything you have to the 16 sets in this course of exercise.